Save Flower Seeds To Save Money While Expanding Your Garden! Saving flower seeds to propagate new plants in your garden is a fun fall activity. I will try to outline a general process, and some examples of common flower seeds you can save/store. In fact, saving your own seed is the most economical way to get plants for your garden. By germinating/growing more plants yourself from flower seeds you gather can mean big savings in making a beautiful garden. Think of it like this – a mature perennial flower costs $8-$12 at a nursery or big-box store. Well, with a bit of effort and patience you can have that plant, and many more for less than the cost of ONE plant purchase. Your seed can come from any viable plant – native, heirloom, cultivar – but not a hybrid (more on that later). In general, this is all you need to gather all the flower seeds you want. Paper bags (1 for each species of flower you wish to collect). I just get the regular ‘lunch bags’. You can compost these after you are done, or save them for next year. A pair of gloves (optional) – some species can irritate skin, and other seed heads can poke/prick you during handling. And when it comes time to separate the seed after drying, it is best to have a decent sized table to work on. If doing milkweed, aster, or flowers that have feathery/fluffy tails on the seeds you should consider doing this on a calm day outside. You don’t want to be chasing floating/feathery chaff for the next week inside your house! You should collect flower seeds about 2-3 weeks after the flower has stopped blooming, and the seed head has fully ripened. If you dead-head your flowers throughout the season, you can collect seed heads at this time if they are dry/crumbly. So, for early Spring bloomers this would be late May and into June. Most other flowers will be August-October. But, the main thing is to pay attention to when the flowers stop blooming, and then just check them a few weeks after. Also, a good rule of thumb is to wait until the seed head is dry or fluffy (depending on the flower) before picking them. This way you know that the seed has had enough time to mature and become viable. If you collect seeds before they fully develop and become viable, then you probably won’t have much (if any) germinate when you try to grow them. How do I know the seeds are fully developed? If the ‘former’ bloom looks dry, fluffy, or ugly then there is a good chance it is ready for harvest. At the end of the article I’ve included a gallery of some common seeds you may encounter, and a good way to make sure they are ‘ripe’ or fully developed is to check the color and hardness of the seed itself. If you are collecting seeds not covered here or in other articles on our site, then do a bit of research to determine what they ‘should’ look like. Then when you go out to collect seeds, just sacrifice a seed head right then and there whilst collecting, to see if they match the pictures/feel of what you researched. Can you save seeds from cut flowers? Typically, no. Cut flowers are typically picked during the height of their blooming season. In general a flower will not begin developing seeds until they have been pollinated. If the flowers that you have in your vase were pollinated prior to being cut, then perhaps full seeds could develop, but probably not. Normally it takes at least several weeks, if not months for seeds to fully develop and become viable. In some cases pods have to form. It may be possible that some species can continue to develop their seeds after being separated from their root (as what happens with cut flowers), but it is probably unlikely. So, I wouldn’t recommend doing this. But, there is no harm in trying I guess, so good luck! But I wouldn’t bother with this, as I like to give myself the highest chance of germination for seeds I collect/sow. My 2018 seed harvest. Seeing this makes me want to start a nursery just thinking of how many plants I can grow from this haul. Money money money – that is the most basic answer. I generally grow all my flowers from seed. It is just so expensive to go to a garden center or big box store. I don’t like dropping $50 on some annuals or perennials that may not last long, or need special care that requires a lot of extra chores. So, I either buy or collect seeds and germinate them myself. For example, I have around 10-15 Echinacea coneflower plants in my garden right now. This would have cost $75-$100 dollars to purchase at a garden center. But instead, I spent approximately ~$5 on two packs of seeds 5 years ago at our old house. I’ve been saving seeds from these two different species, and making new plants ever since. In fact, probably 90% of the plants in our garden came from seed we germinated. Counting them all up between our front and back yards there are probably 200+ perennials, and at least 25 different species. It also gives you another excuse to be outdoors…. Also, you will get closer with nature! Once you have saved seeds from a plant, you start to understand its reproductive process better. Doing this always gives me a greater appreciation for how the species survives, and how it has developed various mechanisms/strategies to survive. Collecting flower seeds gives you greater knowledge, and gives you a ‘different set of eyes’ when you look at plants. These are just some of the reasons I enjoy saving flower seeds. After a flower blooms, it will begin seed production. The amount of time it takes a flower to completely develop a seed varies by species, but generally takes at least a couple of weeks. There are many different genus of plants, and each species will go about producing seed differently. So, the first step is research about the plant you want to grow or collect seed. Ensure you are able to identify it during/after blooming. And if you can find any info as to the seeds, do so! Then it is a matter of waiting/checking to make sure that seed heads turn brown and dry out. Once this occurs, I just (in general) snip them off with a pair of scissors or pruning sheers, and place them into a brown paper bag. Then I will store the bag in a cool dry place for about a week. The brown paper bag is important, as it will allow the seed to ‘breathe’, ensuring that the moisture leaves. If your seed is too moist, and you go to store it over the winter or for more than a year, it could rot and become useless. When I’m drying seeds, I usually maintain a humidity level of about 45% in my basement by using a dehumidifier. My basement is quite large at about 1600 square feet (~150 m^2). I purchased this humidifier to keep it below 60%, and it has done exceptionally well. Besides regular emptying (during summer), the most maintenance it has needed is cleaning the filter every couple of weeks. But it keeps our basement from becoming musty / too humid. It can give you a great environment for drying seeds, as well as preventing mold. You need to be faster than the birds…..
One of the methods that flowers propagate is by birds eating the seed and then dispersing them. Certain species of flower will have nearly all their seeds consumed quickly, so you need to harvest those seeds before the birds get them! For instance, Echinacea Purpurea and common sunflowers are LOVED by gold finches. Tall sunflower is also consumed quite quickly. This year I barely got 30 seeds from my native Common Sunflower, Helianthus annus. Birds are voracious eaters when it comes to seeds! After you’ve collected the seed heads, it depends on the type of seed, but you need to begin the process of separating the seed from the dried out flower head. I will now list a few methods and link to some short videos describing this process. Depending on what you are doing – a strainer and two plates/bowls, or some other container could be quite handy. This depends on the species, but if you have a ‘messy’ one (helianthus annus), these are a few tips than can save you some time and labor. Once you have the seed and chaff in front of you, you can just manually separate it with a credit card, drivers license, or even a scrap piece of card board. This method is tedious, but effective. I generally use this on common sunflower seed, Helianthus Annus. This method involves sifting the seed/chaff mixture over a container. In some cases this will result in the seed falling through the strainer (like for Lobelia), and other times the chaff falling through the strainer (ex. False Sunflower, Heliopsis). Sometimes using two containers so you can repeat the process several times can be quite effective. If there is a gentle breeze outside, you can take your seed out in a bucket, and gently lift it up above the bucket or bowl. Then drop the seed back into the bucket. Assuming the seed is heavy/dense enough, it will fall back into the bucket while the chaff will blow away with the breeze. This method is somewhat risky, as a sudden gust can scatter your seed all over your lawn. But, I’ve found it to be quite effective for certain species, like Plains Coreopsis. To store the seeds, you typically just need to keep the dried seed in a sealed plastic bag or container. Old jars work well for this too. For most species of seed this works just fine. Generally, many species can be kept for at least one year with no issue. Some can last for several years. For example I’ve germinated Plains Coreopsis several years after collecting the seed. But as a rule-of-thumb, you should try to plant/germinate the seeds the following Spring rather than storing them for too long. My crude, DIY seed library. Just a large plastic tote filled with zip-lock bags and other Tupperware containing seed. Nature is a highly diverse place, and that means that although most dried seeds can be stored in ziplock bags for at least a year, it doesn’t work for all species. Some seeds must never dry out (Paw Paws, some native lilies). Others have high germination rates if they are directly sown in the fall (Golden Alexander, Joe-Pye Weed, Tall Sunflower). Some need to be refrigerated for their entire storage all winter until you sow (Virginia Blue Bells, Bottle Gentain). So you should do your research to try to ensure the most success. But, if you can’t find any info the safest method is to directly plant some seeds where you want to propagate more flowers, and store the rest. I generally do as much research as I can, but am not afraid to experiment. If you are collecting your own seeds, then you shouldn’t be afraid to experiement either, as you will likely have a large supply. So, sprinkle some seed where you want the plants to grow. If they germinate directly in the garden, just as happens in nature, then that is just like getting a head start for the plant! This section will now detail some common methods for harvesting flower seeds based on the type of flower. Some of these methods are incredibly easy, like verbena or Mexican Hat Coneflower where you just crumble the seed head a bit to release all the seeds. Other methods are tedious, such as Common Sunflower (Helianthus annus), where you need to break up the seed head and tediously separate the seeds from the chaff one at a time. Throughout the years I’ve found that certain techniques work well with certain types of flower, and are transferable to other species in the same family or genus. Seeds from these daisy like flowers vary wildly in how easy they are to obtain. Some, such as Asters (New England, Smooth Blue, Aromatic) will have fuzzy/cotton tails attached to the seeds that are stuck in the flower head. These seeds are quite easy, as you can just pull them out. I don’t worry about the cotton tails stuck to the seeds, as they don’t matter come planting time. The most challenging flower I’ve found for collecting seeds in this family is coneflower seeds. These are stuck in the seed-heads quite rigidly. For these, I put several seed-heads in an empty coffee container, or Tupperware/plastic container with lid. I then shake this violently for about 30 seconds. with the lid on for about 30 seconds. After this you can open it up, remove the dead flower heads, and you will be left with about 50/50 chaff and seeds. It is easy to get the seeds if you follow this process. For Rudbeckia, or Black-Eyed Susan this same process can be applied. Or, you can just flick the seed-heads with your finger over a small plate, then just collect the seeds. The main challenge with Rudbeckia is separating the seed from the chaff. You are dealing with small black chaff tyring to find small black seed. If in doubt, save all of it, and then just surface sow all the Rudbeckia. Sunflowers, and sunflower like flowers hold their seeds in a similar manner. You just need to find the most efficient way to get the seeds out of the center of the flower. And as I stated – it greatly helps to know what the seed looks like! Sometimes the chaff looks very similar to the seed you want. So, it is best to know this going in before gathering seeds, so you don’t inadvertently sow the chaff! I’ve provided a number of images in a gallery at the end of this article to help you in this regard. For milkweeds, you really need to watch the pods, and at what level of development they are in. Once the pods start to turn brown, you can collect them. Then, I wait until they just start to open up. I will hold the base with one hand, then pry open the top (where all the cotton is) with my other hand, similar to how you peel a banana. Then reach into the pod at the top, while simultaneously pinching the bottom (to hold the seeds in the pod). Next I’ll pinch all of the cotton I can grab with my thumb/index finger, and pull it out whilst holding the seeds within the pod. Typically you’ll need to do this a few times until all the feather/cotton is gone. Finally, you just empty the pod into a baggy, and label it with the name/year of harvest. This allows me to separate nearly all of the cotton and only have seeds. 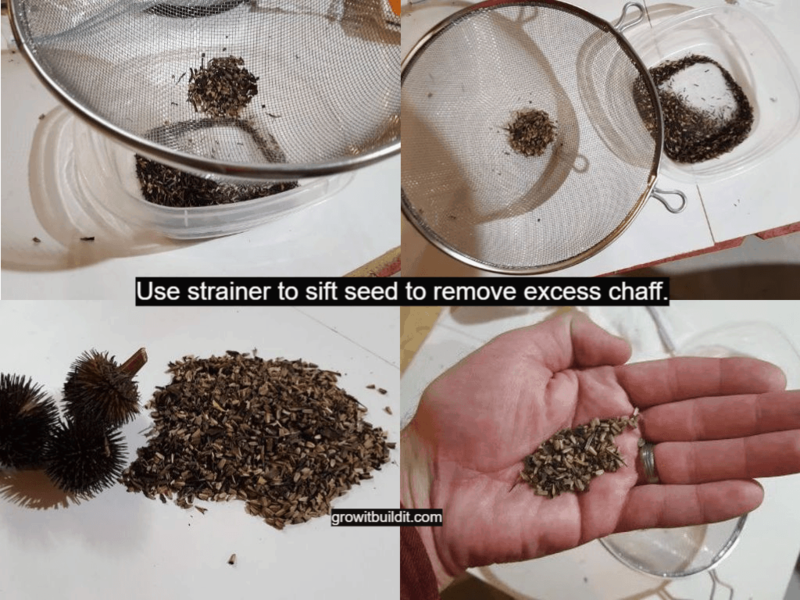 With this method you can easily process thousands of seeds in a short amount of time. It makes making milkweed seed bombs easier more efficient! This is where research comes in handy! Legumes generally make seed pods completely separate from the flower head. If you know your plant is a legume or member of the pea family, then you just need to wait for the pods to form, and ripen (turn brown). Then just collect the seeds. Common Legumes in the garden are Lupine, Blue False Indigo, and Partridge Pea. The seeds are contained inside pods, just like peas or green beans. Just break open the pod and collect the seed. This picture is of Showy Tick Trefoil seed pods. There isn’t a lot of info you need for saving seeds from the pea family / pod-producing plants. You just need to break open the pods, and separate the seed. It isn’t that exciting of a process. More tedious really, but it works. Certain plants will have a distinct packet (my term), or pod with a large number of seeds that is formed from the flower head. These are great, as you just need to clip off the stem that holds these, and then rub them in between your fingers to have them release their seeds. You can then use a strainer with a couple of buckets outside when there is a slight breeze to remove the chaff if you so desire. Example of garden plants in this category include Cardinal Flower, Great Blue Lobelia, Columbine, and Plains Coreopsis. Certain species have better methods than others. For instance, Columbine you just need to shake the bag to release most of the seed. For all of the above seeds, and in general, the next step is to bag them up in small plastic Ziploc bags clearly labeled with the name and year of harvest. This is important as some seeds are not always viable for more than one year. Some species will have the blooms, and subsequently the seeds along the stalk. An example of this is Blue Vervain (Verbena hastata), and Blazing Star, (Liatris Spicata). Collecting this seed months after it is ready is generally very easy. For some reason, I’ve not seen many that were eaten by birds. Seed head of Blue Vervain in October. (Verbena hastata). Collecting seeds from these stalk producing plants is quite easy. Just run you hand along the stalk to release the seed (and some chaff). You can gather hundreds and hundreds of seeds from just one plant in this manner. When I want to have some more plants, I just sprinkle the seed in a cleared area. Generally some will propagate and I will expand my garden in this manner – for free! Another example of this type of plant behavior would be the Mexican Hat Coneflower (Ratibida columnifera). This species is jut about the easiest seed to gather, as there is almost no chaff. Collecting 100-200 seeds takes about 3 seconds! To save seeds from trees, the process is similar to flowers in that first you need to do some homework and research what the seed looks like for the tree you are interested in. Sometimes this is very obvious. For example, Oak trees produce acorns, which will generally germinate easily if they are kept moist over the winter in the ground. Another obvious tree are maple, as they make their small ‘helicopters’ seed pods that twirl down from the tree in the spring. Once you’ve done your research it is a matter of going out, locating a tree, and then hope that it produces seed. Just make sure you know when the tree produces seed, as it varies by the species. Some are incredibly easy, while others challenging (Conifers, Tulip Poplar, for example). I recently collected a pile seed pods from the Eastern Redbud Tree. I hope to germinate most of them next spring, so that I can add some color to the woods behind my house. So, this tree flowers early in Spring, then the pods take all summer to develop, finally becoming dry/brown in Autumn. Eastern Redbud Seed Pods on the trunk of a young sapling. Take a Hike – seriously! I gather seed from the wild every year. While walking around a local park you will often find different colonies of native plants. Even while I am driving I generally scan the ditches to see what is growing. If I see a plant that I may want, I make a mental note and will return in a few weeks/months to try to gather some seed. I’ve collected New England Aster seeds from the wild, New York Ironweed, Virginia Blue Bells, and Joe Pye Weed. What is great about collecting true ‘local’ seed is that you know that it has adapted/evolved to your area. It should be able to survive any natural pest or disease common to your locale. Also – your local community may have ‘Seed Swaps’ where you bring seed to trade with other gardeners. Research your plants thoroughly. You may be in love with your friends dwarf orange coneflower, but if it happens to be a hybrid (most likely), then the seed will not produce the same plant. Hybrids will produce one of their ‘parent’ species, if it is even viable. So, again – do your research – if you can’t identify it to some native or cultivar, don’t collect it. And one more big resource – FACEBOOK – There are many SEED SWAP groups on Facebook now, where members trade seeds with each other via Self-Addressed-Stamped-Envelopes (SASE). I’ve sent seed to several people this way. This is the best ‘new’ way to obtain different seeds for minimal costs, assuming you can’t find those seeds locally. Join a seed swap group, and post what you have in your ‘library’. Then just post what you are looking for, and you might be surprised with some free seed! Follow us on Pinterest & Instagram.